Mortezaeikia, V., Yegani, R., Hejazi, M., Chegini, S. (2016). CO2 biofixation by Dunaliella Salina in batch and semi-continuous cultivations, using hydrophobic and hydrophilic poly ethylene (PE) hollow fiber membrane photobioreactors. Iranian Journal of Chemical Engineering(IJChE), 13(1), 47-59. V. Mortezaeikia; R. Yegani; M.A. Hejazi; S. Chegini. "CO2 biofixation by Dunaliella Salina in batch and semi-continuous cultivations, using hydrophobic and hydrophilic poly ethylene (PE) hollow fiber membrane photobioreactors". 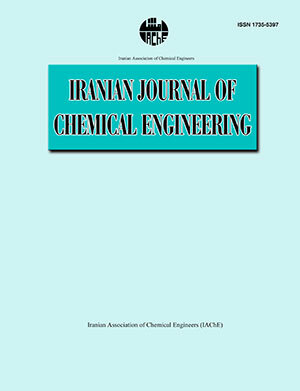 Iranian Journal of Chemical Engineering(IJChE), 13, 1, 2016, 47-59. Mortezaeikia, V., Yegani, R., Hejazi, M., Chegini, S. (2016). 'CO2 biofixation by Dunaliella Salina in batch and semi-continuous cultivations, using hydrophobic and hydrophilic poly ethylene (PE) hollow fiber membrane photobioreactors', Iranian Journal of Chemical Engineering(IJChE), 13(1), pp. 47-59. Mortezaeikia, V., Yegani, R., Hejazi, M., Chegini, S. CO2 biofixation by Dunaliella Salina in batch and semi-continuous cultivations, using hydrophobic and hydrophilic poly ethylene (PE) hollow fiber membrane photobioreactors. Iranian Journal of Chemical Engineering(IJChE), 2016; 13(1): 47-59. In this work, performance of hollow fiber membrane photobioreactor (HFMPB) on the growth of Dunaliella Salina (G26) at various aeration rates (0.1 and 0.2 VVm) and medium re-circulation flow rates (500 and 1000 mL/h) were studied. Cultivation was carried out at both batch and semi-continuous modes in HFMPBs containing neat and hydrophilized in-house fabricated poly ethylene (PE) membranes at fixed light intensity of 300 µmol m-2 s-1and temperature of 30 oC. Microalgae showed better growth in hydrophobic module in both cultivation modes and modules. Maximum biomass concentration, CO2 biofixation and specific growth rates equal with 0.71g L-1, 1.102g L-1 d-1 and 0.224d-1 were obtained for non-wetted membranes, respectively. Comparing the performance of both modules showed that the impact of cultivation mode on the CO2 biofixation rate and CO2 removal is more pronounced than the impact of mass transfer resistance in membrane contactors. The obtained results show that the mean CO2 biofixation rates in semi-continuous cultivation for both neat and hydrophilized modules are higher than that in batch cultivation in all operating conditions. It was also found that the hydrophobic membranes are much preferable than hydrophilic membrane in HFMPBs. Keith, D. W., "Why Capture CO2 from the Atmosphere? ", Sci., 325, 1654 (2009). Grobbelaar, J., "Factors governing algal growth in photobioreactors: the open versus closed debate," J. Appl. Phycol., 21, 489 (2009). Posten, C., "Design principles of photo-bioreactors for cultivation of microalgae," Engineering in Life Sciences, 9, 165 (2009). Cheng, L. Zhang, L. Chen, H. and Gao, C., "Carbon dioxide removal from air by microalgae cultured in a membrane-photobioreactor", Sep. Purif. Technol., 50, 324 (2006). Lam, M. K. Lee, K. T. and Mohamed, A. R., "Current status and challenges on microalgae-based carbon capture", Int. J. Greenhouse Gas Control, 10, 456 (2012). Pires, J. C. M. Alvim-Ferraz, M. C. M. Martins, F. G. and Simues, M., "Carbon dioxide capture from flue gases using microalgae: Engineering aspects and biorefinery concept", Renewable and Sustainable Energy Reviews, 16, 3043 (2012). Fan, L. H. Zhang, Y. T. Cheng, L. H. Zhang, L. Tang, D. S. and Chen, H. L. "Optimization of Carbon Dioxide Fixation by Chlorella vulgaris Cultivated in a Membrane-Photobioreactor", Chem. Eng. Technol., 30, 1094 (2007). Fan, L. H. Zhang, Y. T. Zhang, L. and Chen, H. L., "Evaluation of a membrane-sparged helical tubular photobioreactor for carbon dioxide biofixation by Chlorella vulgaris", J. Membr. Sci., 325, 336 (2008). Maximous, N. Nakhla, G. and Wan, W. "Comparative assessment of hydrophobic and hydrophilic membrane fouling in wastewater applications", J. Membr. Sci., 339, 93 (2009). Adibi, A. Evaluation Of Effective Factors On Lipid Extraction Process From Microalgae, MsC thesis, Sahand University of Technology,Tabriz, Iran, Sep. (2011). Katsuda, T. Yegani, R. Fujii, N. Igarashi, K. Yoshimura, S. and Katoh, S., "Effects of light intensity distribution on growth of Rhodobacter capsulatus", Biotechnol. Progr., 20, 998 (2004). Yegani, R. Yoshimura, S. Moriya, K. Katsuda, T. and Katoh, S., "Improvement of growth stability of photosynthetic bacterium Rhodobacter capsulatus", J. biosci. bioeng., 100, 672 (2005). Hejazi, M. A., "Selective extraction of carotenoids from the microalga Dunaliella salina with retention of viability", Biotechnol. bioeng, 79, 29 (2002). Carvalho, A. P. and Malcata, F. X., "Transfer of Carbon Dioxide within Cultures of Microalgae: Plain Bubbling versus Hollow-Fiber Modules", Biotechnol. Progr., 17, 265 (2001). Tang, D. Han, W. Li, P. Miao, X. and Zhong, J., "CO2 biofixation and fatty acid composition of Scenedesmus obliquus and Chlorella pyrenoidosa in response to different CO2 levels", Bioresour. Technol. 102, 3071 (2011). Chisti, Y. "Biodiesel from microalgae beats bioethanol", Trends. biotechnol. 26, 126 (2008). Reichert, C. C. Reinehr, C. O. and Costa, J. A. V., "Semicontinuous cultivation of the cyanobacterium Spirulina platensis in a closed photobioreactor", Br. J. Chem. Engin. 23, 23 (2006). Chiu, S. Y. et al., "Reduction of CO2 by a high-density culture of Chlorella sp. in a semicontinuous photobioreactor", Bioresour. Technol., 99, 3389 (2008). Richmond, A., Handbook of microalgal culture: biotechnology and applied phycology, John Wiley & Sons, (2008). Ferreira, B. S. Fernandes, H. L. Reis, A. and Mateus, M.," Microporous hollow fibres for carbon dioxide absorption: Mass transfer model fitting and the supplying of carbon dioxide to microalgal cultures", J. Chem. Technol.